Why Choose a Night Magic Dane Puppy? Below is a list of some of the top benefits to purchasing a puppy from us here at Night Magic Danes. 1.) Love…All Night Magic Dane’s puppies and adults, First and Foremost, are beloved family members, who are exclusively inside companions. 2.) 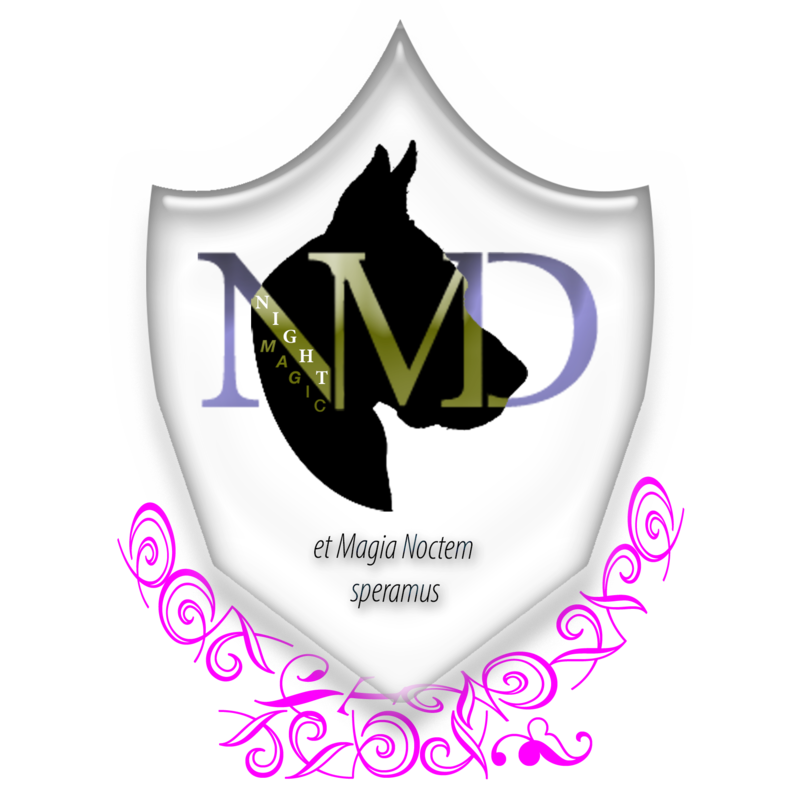 Responsibility…NO Night Magic Dane puppy will ever be sold to a family who would intend to keep it outside, or who would ever treat it as anything but a beloved family child. 3.) Training…A Night Magic Dane puppy not only will be raised inside, it will also be started in puppy classes. Puppies begin to learn very early in life, and s a breeder I can get a jump start on the learning curve with my puppies, by starting, and being consistent with simple commands and actions, from birth on. Puppies will understand No, Come, Their name (which you will provide), Go potty, Inside and Outside. They will also be beginning to understand Sit, Lie down, and Shake hands by 8 weeks of age. 4.) Socialization…A Night Magic Dane puppy will not only be well socialized around cats, other dogs, children, horses and people, it will also have already had it first few experiences in a car and on car rides, so that if you come and pick up your puppy that car ride will not be its very first experience, which could be traumatic if it has never ridden in a car before. I also will give my puppies their first 2-3 baths and tow nail clippings, always practicing calm discipline, as all of these first experiences need to be fun for the puppy, so that it will be prepared for its new parents and know how to act. 6.) Omega 3 Fatty Acids…I feed my adults and puppies, starting at birth, Omega 3 fatty acids which helps with eye sight devolvement and brain functions. Since I have started my Omega 3 program I have noticed marked improvement in the trainability, and attention span of my pups, and have had several pups go on to become therapy dogs. 8.) Extended Health Guarantee…I also offer an Optional 5 Year Extended Health Guarantee, if you continue with the omega 3 fatty acids, and an Optional *Life-Time 8 Year Extended Health Guarantee if you continue with the omega 3, as well as a joint supplement. You must sign up for automatic shipments to qualify for this offer. 9.) Weekly Updates…I send out weekly e-mail updates on my puppies, letting you know what I am doing that week with them, where they are at in training, and how they are progressing, and well as offering tips and advice on how to handle certain problems that may arise for their age group. 10.) Picture Updates…I update my puppy pictures with many new beautiful individual and/or group pictures every week, so that you and your family may watch your puppies development from little 1lb newborn to a whopping 18-30lb bouncing 8 week old. I also keep my past puppy pictures up to date, as I keep in contact with all of my past puppy owners and am ALWAYS available for advice. 11.) Proven Stock…I keep all of my past puppy’s pictures as up-to-date as possible, and you can easily see, at any stage in devolvement, what a Night Magic Danes puppy and adult will look like. 12.) Puppy Placement…I offer specialized placement for my puppies. Each puppy has an individual personality, energy level, and look and not just any puppy will fit just any home. So biased off the answers provided on the puppy buyers screening form, I will place the best puppy for you in your home so that every puppy and puppy owner has the best match possible. 13.) Testimonials…I provide typical past puppy owner comments on my puppies page. They range in testimony from beauty, size, temperament, personality to just plain funny stories. 14.) Part of the Family…Once you are a puppy owner of a Night Magic Dane puppy you are family, and I will keep up with you and your puppy offering periodical updates about common problems that occur during certain stages of development and how to handle them as well as always being available via phone or e-mail for any question or concerns that you may have, for the life of your puppy…my philosophy is no question is to dumb except the unasked one. 15.) Competitive Pricing… I offer a pre-birth special to encourage early deposits so that 1) I am confidant that my precious babies are brought into this world with a wonderful family awaiting their arrival, the way a baby should come into this world! 2) so that responsible puppy owners are rewarded for all of their foresight and planning in anticipating and preparing for their new arrival:) this allows my price to be high enough to weed out most of the people who just want a big yard ornament or who are impulsive puppy buyers, but still low enough to allow me to be very picky about where my puppies go, and to whom they go home with. As while this is my business, my puppies and dogs are first and foremost my babies! Because when it comes to trying to decide on a puppy and a breeder, sight unseen, we understand how it can seem very unfamiliar, scary even. There are so many to choose form, how do you begin to make a decision. Well first you must Love the look of the dogs, because your puppy will look like some version of one or both of it’s parents, you won’t get a silk purse from a cow’s ear. Second you must like the breeder, do they answer all of your questions, do they make you feel comfortable, do they have morals, are they in it for the love of the breed, is it just a hobby, or are they just trying to make as much money with as little hassle as possible in their life? And finally you must approve of the conditions that the dogs and puppies are being kept and raised in, are they well fed, loved, cared for… Because you would never want to support such a business, and when you purchase a puppy you are supporting that breeder, and their goals and standards. Here at Night Magic Danes “the dogs rule” nothing is to much, no effort to hard no night to long. My dogs are my life and my puppies are my pride and joy and placing them in permanent life long homes where they are truly loved and appreciated, as I love and appreciate mine, brings more happiness into my life than I ever imagined possible. To hear from my puppy owners and how my puppies are doing brings me nothing but joy, and if one of my puppies falls sick then I grieve and pray just as its new family does, and rejoices once it is better, no matter the age of the puppy or how long is has left me, it will always be my puppy, a life that I am ultimately responsible for, as I do take full responsibility for bringing its life into this word, and this is nothing I take lightly.